SUMMARY: This is a solid budget transmitter and headphone system that will help people with hearing loss watch TV. It doesn’t have top of the line sound quality or the most comfortable headphones, but for the price, they are a good option if you are looking for a TV listening system under $50. PROS: Inexpensive, easy to use, comes with comfortable headphones. CONS: The volume control dial is hard to adjust. Some users find that the sound from the headset has too much static. The headband on the headset is flimsy and could be improved. Since it uses infrared technology, you need line of sight between the transmitter and the headset. Otherwise, the sound is replaced with static. If you aren’t picky about sound quality, the Unisar TV listening system is a decent product that will help the hard of hearing improve their enjoyment of watching TV for a pretty low price. The Unisar is the standard transmitter and headset design. The headset is quite large and not as lightweight as some of its competitors, but most people seem to find them comfortable enough. The headphone unit has its own volume control that you can adjust right on the headphones. The charger for the device is built into the IR transmitter, so you don’t have to worry about replacing batteries. The TV920 system uses an infrared signal that is sent from the transmitter (that you have attached to your TV) to the wireless headset. Since this device uses Infrared, for the system to work you need to have a clear line of sight from the transmitter to the headset (the same way a TV remote works). You might find that you have to sit pretty close to the TV to get the system to work. The range is supposed to be 33 feet within the same room as the transmitter, but that may not be entirely accurate. Some users have complained of the sound crackling or sounding fuzzy, but that is probably related to the IR signal, so you have to make sure that there is always clear line of site. 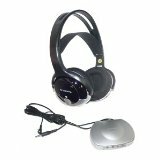 The headset that comes with the unit is relatively bulky, but a lot of people do find this style to be very comfortable. If you don’t find this style of headset comfortable, you can look at some of the higher-end Sennheiser models that are much more lightweight (and much more expensive). One problematic design issue is that the volume control wheel is small and a little challenging to locate and adjust when the headset is on. It is easy enough to remove headset then change the volume until you start to get used to adjusting while wearing the headset. Another minor issue with the headset is the band that adjusts the headset isn’t very durable and can break easily, so changing it can be a bit of a problem if you aren’t careful. The battery is located in the headset, and you plug it into the transmitter to recharge. Officially the battery will run for 15 hours; some users have gotten up to 18.5 hours on one charge. Most people don’t watch TV for 15 hours at a time, so the battery life works well for most users. You can’t use the headset while charging. One feature that the TV920 does not have, that higher end more expensive TV watching device has is a low battery indicator. When the battery starts to get low, the sound will start cutting out. It can be a big hassle if you are in the middle of watching a show and device stops working. Depending on the complexity of your television set-up, you may have a bit of trouble setting up this device. If you are connecting it directly to your TV, the set up it is simple enough. You just plug the transmitter into the back of your TV using the audio output. It does come with a few different connectors so you should be able to connect the device without having to buy any adaptors (again depending on your TV setup). The warranty on the TV920 is one year from the time of purchase. If you buy it through Amazon, you have 30 days to return it from the time of receipt of shipment. If you don’t want to spend a lot of money and aren’t particular about sound quality, the Unisar TV 920 will probably suit your needs very well. This product does suffer from some of the typical limitations of other IR signal products, but overall it works fine for most users who have hearing loss and need a bit of volume increase to hear the TV correctly.